Costa Maya shore excursions and activities are very important as the area was developed specifically for the cruise industry in order to provide a jump off point for guests porting in the region. There are many things to do in Costa Maya, however not all of them are well suited for families that are traveling with small children. Jungle tours and spear fishing are not exactly what you would call “family friendly.” Not to worry however, participants on family cruises do not need to feel like they should stay on the boat and miss out on Costa Maya, as there is plenty for tot toting groups to do once leaving the port. We have compiled a list of the best five Costa Maya shore excursions for families traveling with children, and from getting soaking wet to figuratively soaking up some culture, there is something for everyone to love, regardless of age. 1. Snorkeling: Although many water based activities can be challenging for children, snorkeling is typically safer and easier, and many children pick up on the basics of the activity with little issue. Although there is a still a minimum age (usually from six to eight years old) children are welcome on many of the snorkeling adventures offered by Costa Maya shore excursions. It is best to choose operators that are experienced with training children and opt for ventures that stick to shallow and calm waters. 2. Ruin Tours: Mayan Ruins are often the highlight of many people’s trips to Mexico, and some of the most exquisite can be found just near the port of Costa Maya. Familiar ancient pyramids with ever ascending steps can be found here, and delicate carvings of local flora and fauna are sure to fascinate children of all ages. Although ruin tours can be some of the most expensive of all Costa Maya excursions simply due to transport, they are also some of the most enchanting and fulfilling. Another hidden benefit of Costa Maya shore excursions to Mayan ruins is that their jungle backdrops provide chance encounters to see some of the local wildlife that resides away from the beach’s shore. You just need to take your peak between Chacchoben, Kohunlich or Dzibanche ruins to visit. 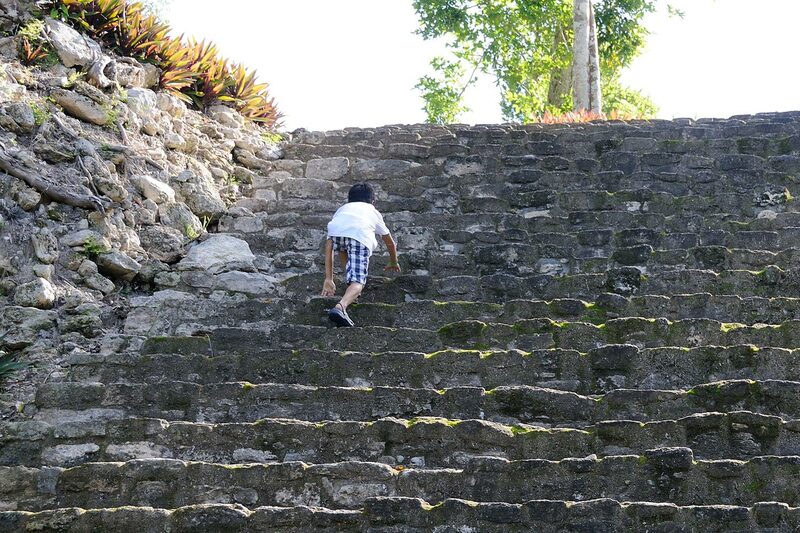 Kids can climb stairs at some of these ancient pyramids. 3. Saltwater Pools: The pair of saltwater pools that encompass much of the shopping and dining found in Costa Maya may seem counter intuitive. However, a break from the crowded pool decks synonymous with Western Caribbean cruises may be just what the doctor ordered. These pools boast water features, crystal blue hues and views like no other. They provide a safe place for kids to play while perhaps their adult supervisors take advantage of a moment to unwind. 4. Fisherman’s Village: One of the most interesting of all Costa Maya shore excursions may actually be one of their most common pit stops. Although not a destination in itself per se, many of the actual Costa Maya shore excursions available in the area stop at the local fisherman’s village. Here local culture can be experienced and unique trinkets indigenous to the area can be yours. Local food and beverage are also on hand at the village and served up with a smile from helpful and friendly port town residents. 5. Jungle Beach Break: A local beach club affords visitors an all inclusive destination where relaxation to the tune of beach chairs and hammocks is combined with high energy water sports like kayaking and paddling. A place to play soccer, rentable all terrain vehicles and a well trained activities staff make the jungle beach break one of the best Costa Maya Shore excursions for families. There is something to do here for just about everyone and time spent at the beach club may be so enjoyable, there may be no room left for any other Costa Maya tours. For guests not wanting to commit a full day to the white sanded beach paradise, the Jungle Beach club is also a popular destination stop on many other Costa Maya Shore excursions including ruin tours, off road tours and village and shopping tours.